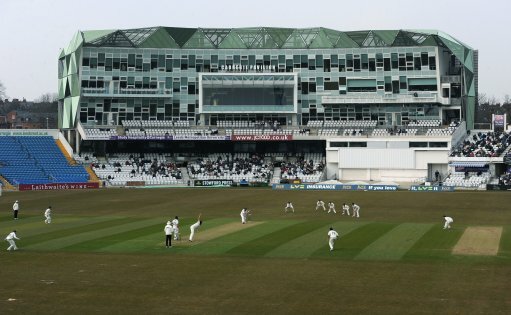 Now that Lancashire and Yorkshire were relegated to the status of also-rans in the annual county championship, their roses fixtures perhaps assumed even greater significance, as it would have been the source of some comfort to the supporters to have bragging rights over their next-door neighbours. During this decade: Yorkshire 1 win, Lancashire 4 wins, 15 draws. Graham Stevenson had a particularly fruitful match as this fixture petered out to a bore draw. Neither team got bowled out as the hosts reached their stiff target, scoring at over four runs per over. This was regrettably another roses match that fell foul of unfavourable spring weather. Lancashire fielded Michael Holding and Clive Lloyd while Yorkshire had to cope wthout Geoffrey Boycott and Chris Old. Yorkshire slipped from 144-0 to 196-5 in the second innings as both teams ran out of time to achieve a win. Two cricketing icons were amongst the runs in this weather-ruined fixture: Clive Lloyd and Geoffrey Boycott. Here was another non-contest which highlighted the folly of three-day County Championship fixtures. Yorkshire staggered to a draw after the in-form Steve O'Shaughnessy had taken three for fourteen from eleven overs. YORKSHIRE versus Lancashire; at Headingley; 26-28 May 1984; YORKSHIRE won the toss. Yorkshire lost their first four wickets for twelve runs whilst Lancashire's openers added 159 for the first wicket. Lancashire versus YORKSHIRE; at Old Trafford; 4, 6 and 7 August 1984; Lancashire won the toss. Apart from a six wicket haul for Paul Jarvis and sixteen overs for only 32 runs from Paul Allott, this was a non-event. Lancashire versus YORKSHIRE; at Old Trafford; 25-27 May 1985; Lancashire won the toss. Martyn Moxon and Kevin Sharp disappointingly could only muster nineteen paltry runs in the four innings between them. YORKSHIRE versus Lancashire; at Headingley; 10, 12 and 13 August 1985; Lancashire won the toss. England hopefuls Neil Fairbrother and Martyn Moxon both smashed a lot of runs, but still no result was possible. YORKSHIRE versus Lancashire; at Headingley; 24, 26 and 27 May 1986; Lancashire won the toss. Paul Allott and Phil Carrick both made good contributions with bat and ball in yet another roses stalemate. Lancashire versus YORKSHIRE; at Old Trafford; 2,4 and 5 August 1986; YORKSHIRE won the toss. Yet another Neil Fairbrother century prevented certain defeat. His team were on the ropes at 2-2 in the second innings. Lancashire versus YORKSHIRE; at Old Trafford; 13-15 June 1987; Lancashire won the toss. Richard Blakey saved Yorkshire from defeat with an unbroken 38 stand for the final wicket with Stuart Fletcher. YORKSHIRE versus Lancashire; at Headingley; 1, 3 and 4 August 1987; YORKSHIRE won the toss. After Lancashire's first innings, the wickets all but dried up as each team settled for yet another draw! YORKSHIRE versus Lancashire; at Headingley; 30 July-1 August 1988; Lancashire won the toss. A quartet of Yorkshire seamers shared twenty wickets as they blew a surprisingly brittle Lancashire away twice. Lancashire versus YORKSHIRE; at Old Trafford; 30 August-2 September 1988; YORKSHIRE won the toss. A career-best innings from Peter Hartley rescued the visitors as he and Fletcher added ninety-one runs for the last wicket. Lancashire versus YORKSHIRE; at Old Trafford; 19, 21 and 22 August 1989; Lancashire won the toss. Despite heroic efforts from Richard Blakey, Wasim Akram was virtually unplayable, conceding 95 runs from 48.5 overs. YORKSHIRE versus Lancashire; at Scarborough; 8-11 September 1989; Lancashire won the toss. The evergreen Fairbrother and Fowler piled on the runs as Lancashire recorded back-to-back roses wins in 1989.